Looking at the ducks enjoying themselves in this mud marshland in a warm clear morning, I wanted to be a duck! If other members of the group were not there, I would probably not doing any painting at all. 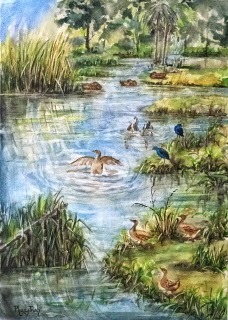 Blue birds and all sort of ducks in a relaxing mode are very interesting. I used a technique I had when painting other paintings with live animals. First sit and watch until they get into my head. I told them to stay there while I worked on the composition! It's how lively and interactive outdoor painting can be. It was mind boggling but it was fun!